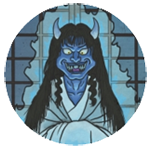 APPEARANCE: Namahage are a frightful demon-like yōkai which live in the mountains along the northern coast of the Sea of Japan. They look like oni, with bright red or blue skin, wild hair and eyes, large mouths full of sharp teeth, and often have horns sprouting from their forehead. They wear straw leggings and raincoats, and carry large blades. INTERACTIONS: Once a year, during koshōgatsu—the first full moon of the New Year—the namahage descend from the mountains to scare villagers. They go from door to and brandish their knives, saying things like, “Any bad kids here?” They particularly enjoy scaring small children and new brides. Despite their ferocious appearance and behavior, they are actually well-meaning yōkai. They are sent down from the mountain as messengers of the gods to warn and chastise those who have been lazy or wicked. ORIGIN: The name namahage comes from another taunt the namahage use: “Have your blisters peeled yet?” In the cold winter months, a lazy person who spent all of his or her time in front of the fireplace would get blisters from being too close to the heat for too long. Namomi is a regional name for these heat blisters, and hagu means to peel. The combination of those words became namahage. Today, the namahage play a major part in New Year’s festivities in Akita Prefecture (old Dewa Province). Villagers dress up in straw raincoats and leggings, don oni masks, and wield large knives. They go from house to house and play the part of namahage. Residents visited by these namahage give presents such as mochi to their “guests,” while the namahage chastise kids and warn them to be good. Newlywed couples are also harassed by these namahage. They are expected to give an account of all of the evil deeds they did during their first year together, as well as serve sake and food to the namahage before sending them off. 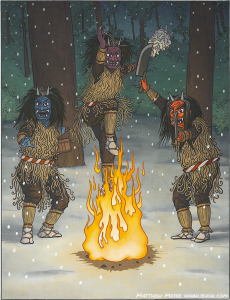 While the name namahage is unique to Akita Prefecture, very similar yōkai are known by many different local names in neighboring regions: in Yamagata Prefecture they are known as amahage, in Ishikawa Prefecture they are known as amamehagi, and in Fukui Prefecture they are known as appossha.